Glass Fusion is the ART of making a design with Glass on Glass through the process of using a kiln to melt two or more pieces of glass together to fuse them. 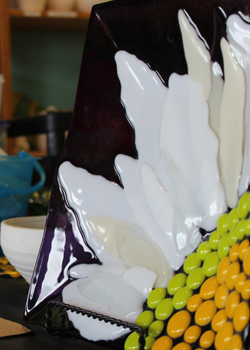 This process creates some amazing fused glass pieces, pendants, trivets, coasters, picture frames, candy/trinket dish, candle holders and platters to name a few. A basic Glass Fusion Intro Class is required for first time artist to teach you proper technique and safety of working with glass as a new art media through a step by step process. Call studio at 624-5955 to register for your class today. We also do group and evening classes. Create your design with multiple pieces of glass in different colors, shapes, and sizes. Price is based on project selected. 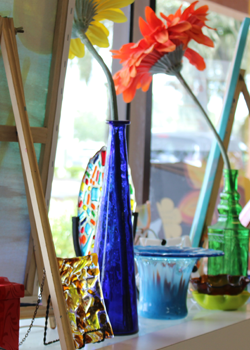 We highly recommend you take one of our “Glass Fusing Intro” Classes first to get you started. Check our Event Calendar for upcoming class dates or if you have 2-3 people interested, we can schedule your own private class.